Hop on over to Amazon where you can clip this digital coupon valid for 10% off Hefty Trash Bags! Even better, many of these items are eligible for Subscribe and Save which means you'll save an additional 5% – 15% and get free shipping. 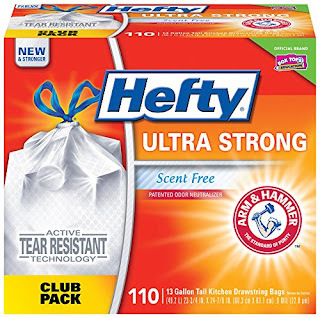 As one idea, you can snag this Hefty 13-Gallon Scent Free Ultra Strong Drawstring Trash Bags 110-Count for just $12.74 shipped when you clip the 10% off digital coupon and opt to Subscribe and Save!